Le Poulet D'Or free range chicken is corn fed to produce golden skin and firm, tender flesh. The flavour is excellent and is especially good when roasted. The size of the chicken makes this a generous meal for four, with plenty of leftovers to serve cold. Preheat the oven to 190°C, gas mark 5. Weigh the chicken and calculate the cooking time: allow 45 minutes per kg plus 20 minutes. Place the onion, garlic, sage, balsamic vinegar and wine or water in a large casserole or roasting tin. Place the chicken on top and season generously. Cover and roast for 1 hour. Uncover and baste the chicken with the cooking juices. 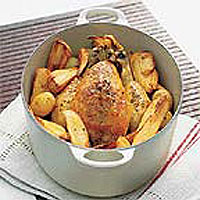 Arrange the potatoes around the chicken, toss in the cooking juices to coat lightly, cover again and continue cooking. About 30-40 minutes before the end of the cooking time, place the parsnips on top of the potatoes and return to the oven, uncovered, for the remaining cooking time. To test if the chicken is cooked, pierce the thickest part of the thigh with a skewer: the juices should run clear and there should be no pink meat. Transfer the chicken and vegetables to a serving dish, cover and keep warm. Skim the excess fat from the juices in the casserole or roasting tin and bring to the boil on the hob. Pour in the gravy, return to the boil and simmer until slightly syrupy. Season, then pour into a jug and serve with the chicken and vegetables. Cooking with ready-prepared frozen vegetables really saves time. You could add frozen carrots instead of parsnips. To make a complete meal, add frozen peas or green beans to the casserole 10 minutes before the end of cooking. Wash hands, equipment and work surfaces thoroughly after handling raw poultry.